Your carpets are in good hands with the team at Bailey’s Floor Care. 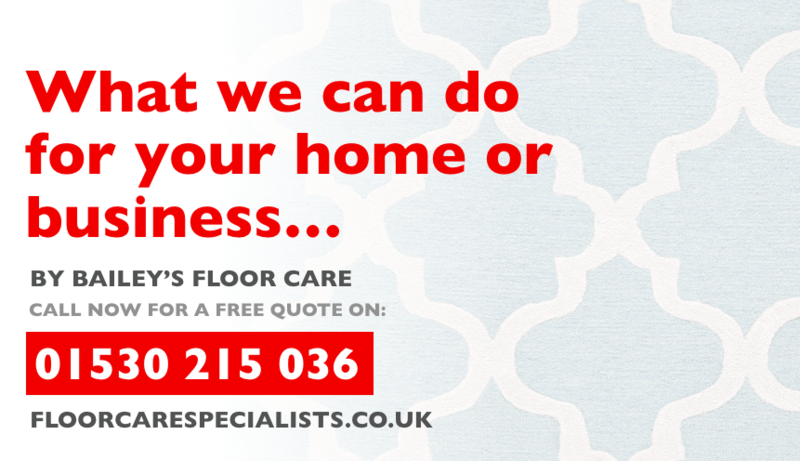 We’re well-known for our knowledge in the professional cleaning of carpets, and in the 17+ years that we’ve been providing professional carpet cleaning in Leicester, Derby and surrounding areas, we’ve provided a first class carpet cleaning service for hundreds of hotels, restaurants, bars, office blocks and members of the public. Our team are trained to international standards through the IICRC, and regularly attend training courses with a variety of suppliers, so they stay up to date with the latest carpet cleaning developments on techniques in the carpet cleaning industry. When it comes to soft furnishings, we’re able to successfully restore and old chair, sofa or curtain – no matter how dirty they have become over the years. Using a top of the range truck-mounted cleaning machine, we can produce great results when cleaning upholstery. And, unlike other upholstery cleaners in the area, we also provide anti-stain protection as an option with our upholstery cleaning services. This invisible layer can be applied to your soft furnishings to massively reduce the risk of staining from a spillage, and you won’t even know it’s there! Rug cleaning is another one of our specialities. We have vast experience in the cleaning of all types of rugs, including Persian, Indian, Chinese, Oriental, Turkish, Moroccan, Pakistan, Afghan, Kilims and even silk rugs. We avoid the use of any harsh chemicals or bleaching agents when we clean your rug, and choose a cleaning method that is best suited for your specific rug type, ensuring the best possible results without the risk of damage. Our service also includes the collection and delivery of your rug upon completion. As well as carpets, we also clean stone floors that have become dull and dark over long periods of time, revitalising marble, travertine and tile floors. It’s important that these high quality floorings are cared for and maintained properly, so we work accordingly. If you have a stone floor in your property which has lost its gleam, the Bailey’s Floor Care team can help. When it comes to wood floor sanding and restoration, we use a detailed 9-step process to effectively and safely bring your wooden floors back to life. Wood can make a truly stunning floor type, but like stone, must be treated carefully and maintained professionally. Our team regularly restore wooden floors in school halls, kitchens, community centres and dining halls, so get in touch if your wood flooring could do with some TLC. A clean and tidy driveway or patio says a lot about a homeowner and how they look after their property. Our team can effectively clean patios and driveways using a high-power jet-wash, and re-sand and seal where needed. Talk to us today about our driveway and patio cleaning and sealing.